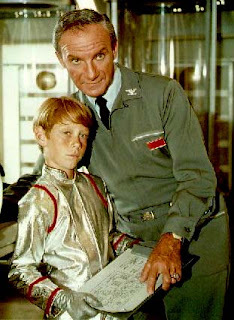 In the 1960s, a certain red-haired, freckled-faced boy appeared frequently on our television screens. No, I'm not referring to Ronny Howard (now filmmaker "Ron" Howard). I'm referring to former child actor Billy Mumy (now "Bill" Mumy), although both are of the same vintage, having been born exactly one month apart. 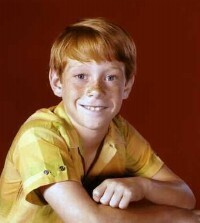 Ronald William Howard was born on March 1, 1954, while Charles William Mumy Jr. was born on February 1, 1954. (Hey, they even share the name "William!). Bill Mumy was born in San Gabriel, Califorrnia, the son of cattle rancher Charles William Mumy and his wife, Muriel Gertrude Mumy (née Gould). According to his official website, Bill began his professional entertainment career at the age of five. In the 1960s, he was a ubiquitous presence on American television, although he is most recognized for his portrayal of Will Robinson in the science fiction series Lost in Space. 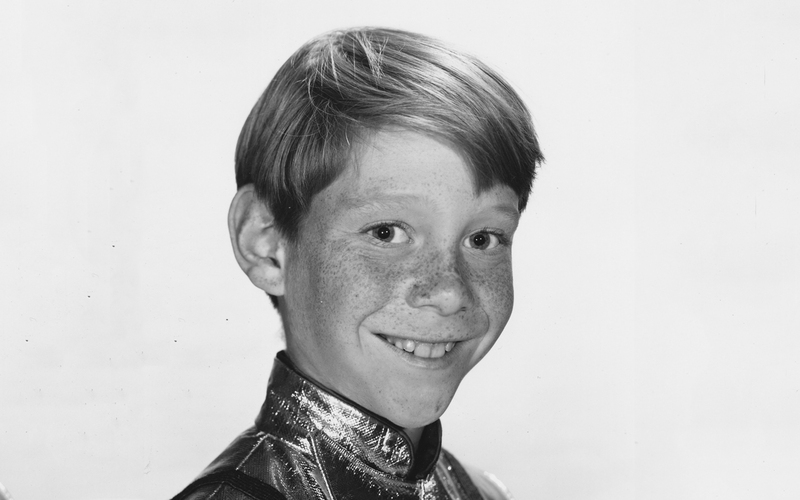 By the time Lost in Space came along, Bill Mumy was already a seasoned TV actor. In a September 11 1986 article by David Wild in Rolling Stone, Bill is quoted as saying that his emergence as a child star might be described as "a lucky break." He stated, "I broke my leg when I was four, and I was in a cast for six months. I had nothing to do but stare at the TV. By the time the cast came off, I was gong, 'Hey that's what I want to do. I want to be on TV.'" According to IMDb.com, Bill's first credited television role was as a kidnapped boy in the drama series Wire Service, about globetrotting reporters. 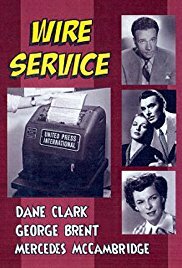 Wire Service starred George Brent and Jack Albertson, but it only aired for only one season, from 1956 to 1957. Three-year-old Bill appeared in a 1957 episode entitled "The Nameless" (Season 1, Episode 37, Air Date: September 9, 1957). Early in his career as a child actor, Bill appeared in two unforgettable episodes of Alfred Hitchcock Presents. 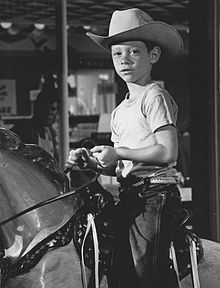 In "Bang You're Dead" (Season 7, Episode 2, Air Date October 17, 1951), he played Jackie Chester, a five-year-old boy who finds his uncle's revolver and plays with it in public, unaware of how dangerous it is. In "The Door Without a Key" (Season 7, Episode 15, he played Mickey Hollins, a boy whose father inadvertently left him at a gas station. Below is a photo of Mumy in a publicity photo for "Bang You're Dead." During the early 1960s, Bill also starred in three episodes of Rod Serling's classic Twilight Zone series, two episodes in 1961 and one episode in 1963. 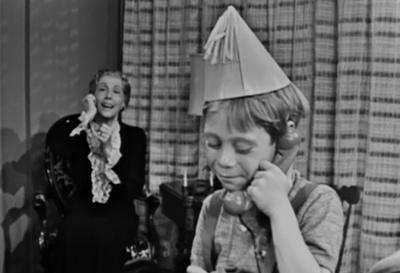 In "Long Distance Call" (Season 2, Episode 22, Air Date: March 31W, 1961), he played Billy Bayles, a child whose toy telephone becomes a link between him and his deceased grandmother. In "It's a Good Life" (Season 3, Episode 8, Air Date: November 3, 1961), Bill game one of his most memorable TV performances as Anthony Fremont, a boy with exceptional mental powers who terrifies his family in order to satisfy his childish whims. (Trivia note: Cloris Leachman of Mary Tyler Moore Show fame, played Anthony's mother in this episode). In "In Praise of Pip" (Season 5, Episode 1, Air Date: September 27, 1963), Bill plays young Pip, a ten-year-old version of a grown soldier dying in South Vietnam. Pip's father, played by Jack Klugman of The Odd Couple, gets to spend a wonderful hour at an amusement park with the younger version of his son . In 1963, Bill also appeared in a Perry Mason episode entitled "The Case of the Shifty Shoebox" (Season 7, Episode 2, Air Date: October 3, 1963. In the episode. he played Miles, a young boy who is taken care of by the manager of truck depot. During the 1960s, prior to his role on Lost in Space, Bill guest-starred in episodes of such TV series as Dr. Kildare (1962), Have Gun-Will Travel (1962), The Fugitive (1964), The Eleventh Hour (1964), The Adventures of Ozzie and Harriet (1964), The Munsters (1965), The Virginian (1965), Ben Casey (1965), Bewitched (1964 and 1965) and I Dream of Jeannie (1965). Lost in Space was created and produced by Irwin Allen and aired on CBS for three seasons, from 1965 until 1968. Set in 1997, it chronicled the adventures of space colonists John and Maureen Robinson (Guy Williams and June Lockhart) and their three children ,Judy (Marta Kristen), Penny (Angela Cartright) and Will (Bill Mumy) The Robinson family became stranded when their spaceship Jupiter II was sabotaged and veered off course. Also along for the ride were Major Don West (Mark Goddard), the ship's pilot, Dr. Zachery Smith (Jonathan Harris), a troublemaking stowaway, and the unnamed Robot B-9. Will Robinson. the youngest of the three Robinson siblings, was heroic and resourceful. Will had a good rapport with Robot B-9. 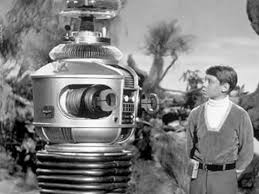 The Robot constantly warned of imminent peril, using the catchphrase "Danger, Will Robinson! Danger!" Of his experience with Lost in Space, Bill is quoted on IMDb as saying, "I had a great time doing Lost in Space With the exception of a couple of days, I don't have any unpleasant memories of the show. The only thing I'm bitter about in a sense is that the show runs constantly in syndication and none of the actors get paid. I made a lot of money at the time, my family invested it well for me, and I have a lot of nice things. I can't complain." In the 1986 Rolling Stone article by David Wild, Bill described what it was like to play Will Robinson: "It was like being the hero in a comic book - you got your superhero suit, you got your robot, you got your ray gun, you got to be an adventurer." The late Jonathan Harris (1914-2002) ,who played the selfish, conniving Dr. Smith, was Bill's mentor during their years on Lost in Space. In 2013, Bill stated the following to pop culture journalist Sam Tweedle: "The show really went the way Jonathan led it. But we had great chemistry together, and we never had a bad day. We were always prepared, as was Bobby May who was inside the robot. When we had our work to do, and I think this is a very big reason [for} the way it went - they'd get us done in a couple of takes. It was easier for the crew and it was easier for us, and people seemed to like it." Bill is also a singer/songwriter and has written and performed with the group America. 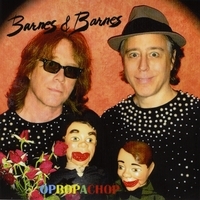 In 1978, he teamed up with fellow musician and songwriter Robert Haimer the satiric "quirky rock duo" Barnes & Barnes. They played fictional twin brothers Art and Artie Barnes. The comical pair are best known for their 1978 song "Fish Heads." Despite focusing on his music during the 1970s, Bill guest-starred on episodes of TV series such as The Rockford Files (1974 and 1975). In 1976, he portrayed Weaver in the short-lived comedy Sunshine. The series was set in Vancouver, British Columbia, Canada and centred around a young widower trying to make a living and while caring for his five-year-old step-daughter. In 1988, Bill appeared on Matlock, the legal series starring Andy Griffith. He guest-starred in an episode of the series entitled "Genius" (Season 2, Episode 20, Air Date: March 15, 1988). In 1991, Bill appeared as Roger Braintree in an episode of The Flash entitled "Good Night, Central City" (Season 1, Episode 19, Air Date: May 4, 1991). In 1991 and 1992, he played Tommy Puck in episodes of Superboy., From 1994 until 1998. Bill portrayed Lennier in all five seasons of the futuristic action series Babylon 5. In 1998, Bill had guest roles in Diagnosis Murder and Star Trek: Deep Space Nine. Bill married Eileen Joy Davis, a childbirth educator, on October 9, 1986. They have two children, a son named Seth Davis Mumy (born October 25, 1989) and a daughter named Liliana Berry Davis Mumy (born April 16, 1994).. Seth and Liliana are both actors and Seth is also a musician. * Bill and Eileen Mumy reside in Laurel Canyon, California. They own many dogs. * Bill's last name is pronounced "Moomy," not "Mummy." * Bill told Rolling Stone magazine that he has fond memories of The Twilight Zone's Rod Serling. However, his experience working with Alfred Hitchcock as a seven-year-old during the filming of "Bang, You're Dead" was not as pleasant. Bill was frightened of the imposing Hitchcock in black suit and sweating profusely. According to Bill, Hitchcock warned the restless child to stop moving around or he would "nail your feet to your mark, and blood will come pouring out like milk." * Bill continues to play his music as a solo artist, occasional guest performer and as half of the duo of Barnes & Barnes. * The multi-talented Mumy is a gifted voice over actor and he has narrated many episodes of A&E's popular Biography series. * In 1991, Bill was an Emmy nominee for original music for Adventures in Wonderland. * In 2018, Bill had a cameo role in the Netflix reboot of Lost in Space.